Plants perennial, mat-forming; rhizomes evident, fairly long, 1.5-3 mm thick, hard, cortex persistent, longer internodes 1.5-3 mm, scales disintegrating to fibers, 4-5 mm, papery. Culms terete, often with 8-12 blunt ridges when dry, 20-55 cm × 0.3-1.3 mm, soft to hard. Leaves: distal leaf sheaths persistent, rarely splitting, proximally red to stramineous, distally green to reddish, papery, apex often dark reddish, subtruncate to obtuse, not callose, tooth present on some or all culms of plant, to 0.5 mm. Spikelets cylindric to ovoid, 5-20 × 2-3 mm, apex rounded to subacute; proximal scale amplexicaulous, apex entire; subproximal scale empty; floral scales appressed in fruit, 20-200+, 10 per mm of rachilla, dark brown, midrib regions often stramineous or greenish, oblong, 1.7-2.5 × 1 mm, apex entire, broadly rounded, usually recurved, mostly carinate. Flowers: perianth bristles absent; stamens 3; anthers dark yellow, 1-1.5 mm; styles 3-fid. Achenes falling with scales, medium to dark brown, obovoid to obpyriform, with short neck, thickly trigonous, angles prominent (keeled), 0.7-0.9 × 0.4-0.6 mm, obscurely to clearly rugulose at 10-20X with more than 20 horizontal ridges in vertical series and/or minutely cancellate at 20-30X. Tubercles brown, rudimentary, mostly apiculate, sometimes pyramidal, 0.05-0.15 × 0.15-0.2 mm. Fruiting late spring-summer. Wet sandy or peaty depressions, pond margins, pine barrens, savannas, mostly coastal plains; 10-200 m; Ala., Fla., Ga., Mass., Mich., N.J., N.Y., N.C., S.C., Va. 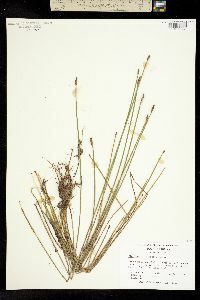 I have not seen specimens to verify reports of Eleocharis tricostata from Louisiana. In the absence of rhizomes and achenes, E. tricostata is easily mistaken for E. montevidensis. Perennial from a short stout rhizome; stems 2-6 dm, compressed or subterete; sheaths truncate and mucronate; spikelet cylindric, 6-16 mm; scales closely imbricate in many rows, broadly rounded above; bristles none; style trifid; achene yellow or yellowish-olive, 0.8-1 mm, obovoid, trigonous, its angles narrowly winged; tubercle minute, depressed-pyramidal to nearly flat. Pine-barren ponds; se. Mass. to Fla.; Mich.